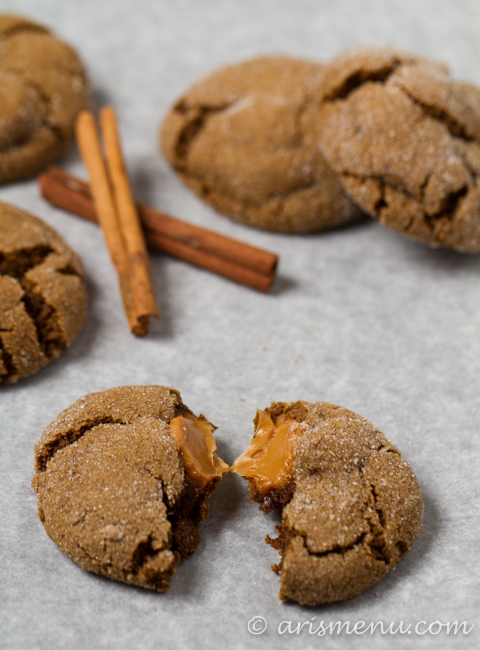 Soft baked ginger molasses cookies stuffed with sweet, gooey caramel. 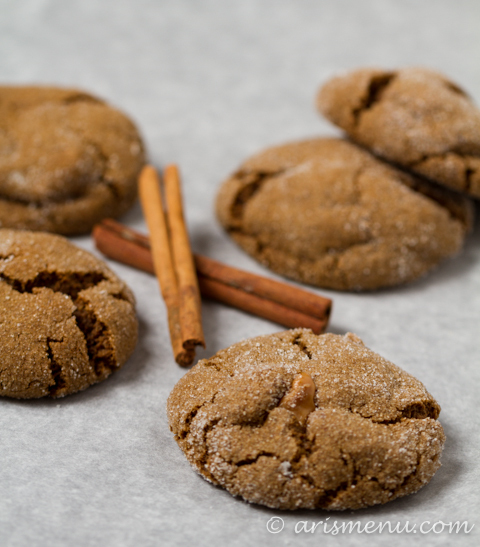 These will easily become your new favorite Christmas cookie! Gluten-free with vegan option. Would you believe me if I told you that until this year, I had never actually done a cookie swap? Okay, that’s a lie, I did The Great Food Blogger Cookie Swap two years ago (And again this year which means you’re getting two…actually 3…days in a row this week. I’m sure you’re devastated. ), but I had never done a real life one. I was just always the one giving away all of the cookies. The idea of getting some in return of kind of amazing! This year we did a cookie swap at book club, and that was my first, official, in real life cookie swap. So much deliciousness. Did I tell you I was in a book club? Ummm, I am SO BAD at it. It’s been going on for almost a year? More than a year? And I’ve read 2 books. Well, that’s not even true. I read one book, then when it was my turn I picked my favorite play (August: Osage County), and never got around to rereading it. I just show up, drink wine, and at Christmas time, swap cookies. In fact, after I brought them in to work, I had requests for more for practically a week. Pretty much until I made them again for Drink & Dish, and had more leftover cookies to bring in to satisfy everyone’s craving. 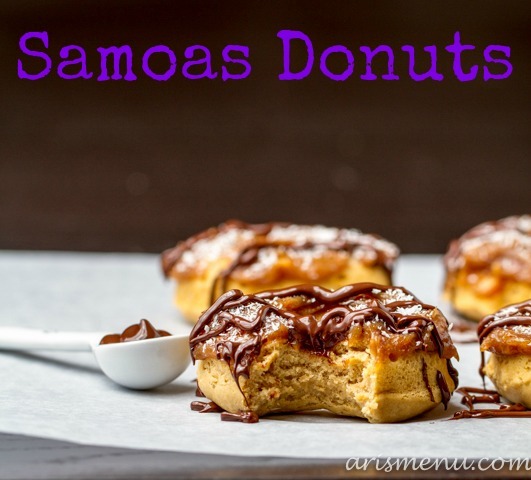 The sugared edges give them a light crispiness, but the insides are cookie-dough-soft. Almost like if it was a gingerbread brownie on the inside. 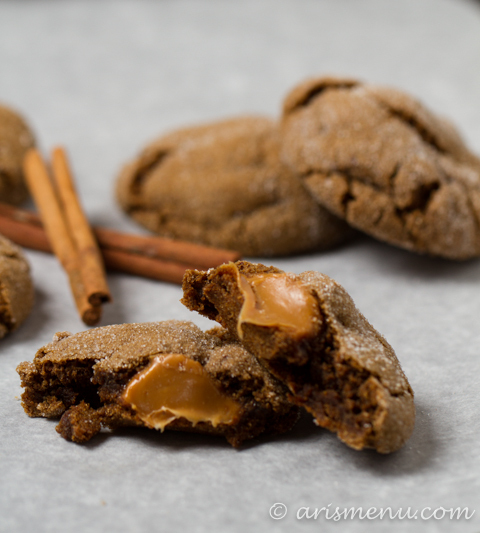 I can hardly describe it–just think absolute perfect cookie texture. And with soft, melty caramel in the middle? It honestly doesn’t get much better. They are best with homemade caramels. 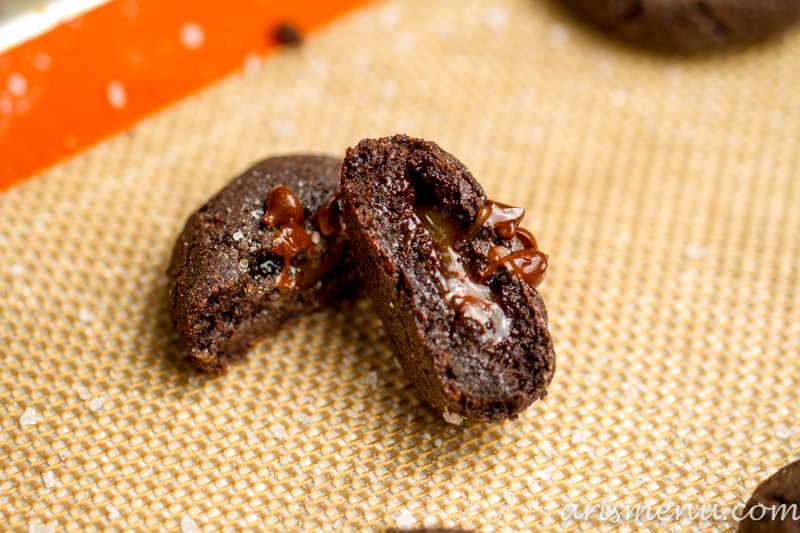 You can see how well homemade caramels melt in these salted caramel mocha cookies. For these I just used store bought because that’s what I had, and ya know what? They still came out awesome. 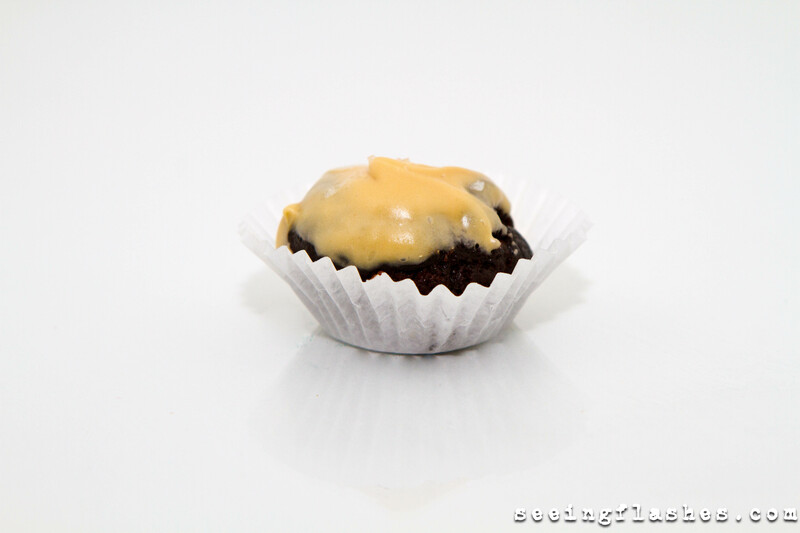 You could also use vegan caramels to make them vegan (captain obvious), or omit the caramels if it’s not your thing. The cookie itself is so good it stands on it’s own. Sooooo, in case you couldn’t tell, the theme of this episode of Drink & Dish is Christmas Cookie Swap! Nicole and I wanted to make sure that you guys had awesome things to bring to all your holiday swaps. 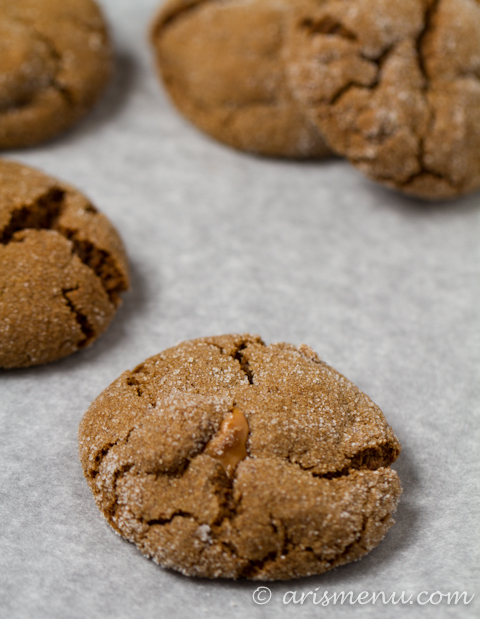 Nicole makes a gingerbread martini that is absolutely to die for, and obviously the perfect pairing to these cookies! 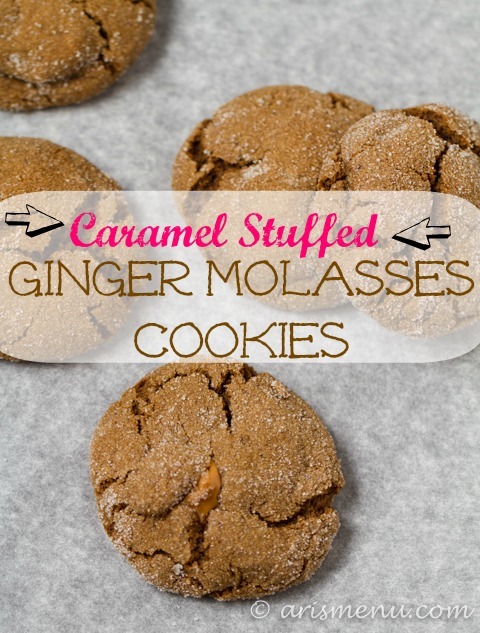 These are absolutely a must-make this holiday season, and a great way to spice up your usual ginger molasses fix! In a medium bowl, whisk together baking blend, baking soda, spices and salt. In a large bowl, beat together apple butter, molasses, brown sugar and vanilla until smooth. Beat in dry ingredients until just combined. Cover and refrigerate for 30 minutes. Preheat oven to 350. Line 2 large baking sheets with silpat or parchment paper.Roll dough into approximately 1" balls. 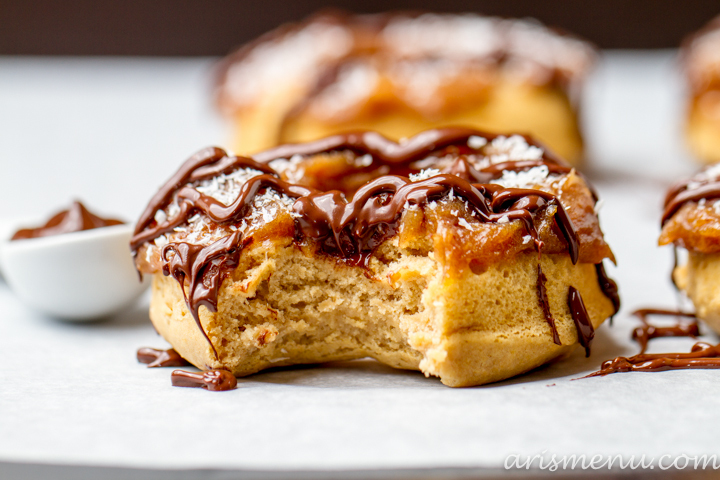 Press caramel inside, and roll dough back around. Make sure caramel is completely covered. Add more dough if necessary. Roll in sugar and transfer to prepared baking sheet. Repeat with remaining dough. Bake until just set, about 9-11 minutes. Cookies will look underdone,. Do not over bake. Cool completely on cookie sheet. Store in an airtight container at room temperature for up to one week. *Use vegan caramels, or omit caramel to keep vegan. You guys you guys you guys you guys!!!!! I have the best house guest in the whole world right now! So I’m going to keep this short so we can commence with cooking, baking, wine drinking, and goat cheese eating. I made banana cupcakes. Then I stuffed them with cream cheese frosting. 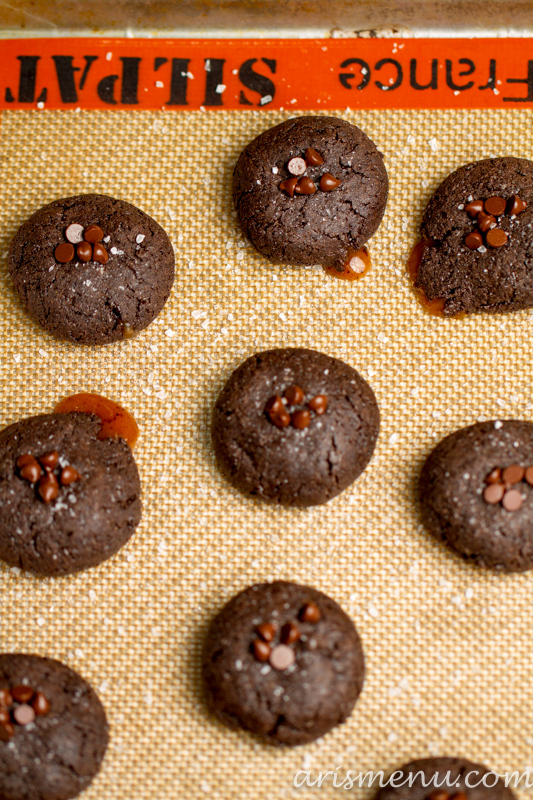 Then I topped them with salted caramel. I mean, how could that even possibly be bad? Did I mention that my “little” brother turned 16? He is also over 6′ tall, and has this deep man voice. When he calls me he just says “Yooooooooo” in this grumbly, ridiculously low-pitched man voice. Like, what IS that? I remember him being born. HOW CAN HE BE A MAN NOW???? I try to imitate the “Yo” voice, but ummm, I have a high-pitched little girl voice, so it doesn’t work. At all. Everyone laughs at me. 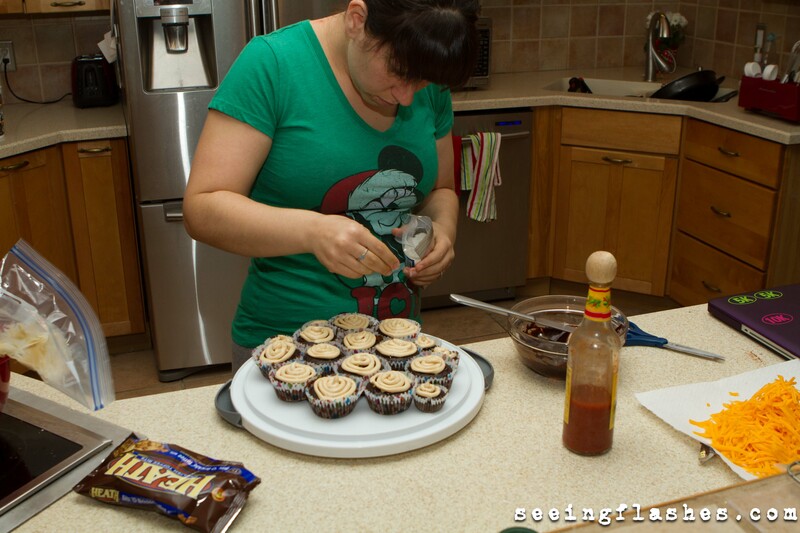 So I just let him stick to the man voice, and I stick to what I’m good at, like making him perfect birthday cupcakes. And they are. 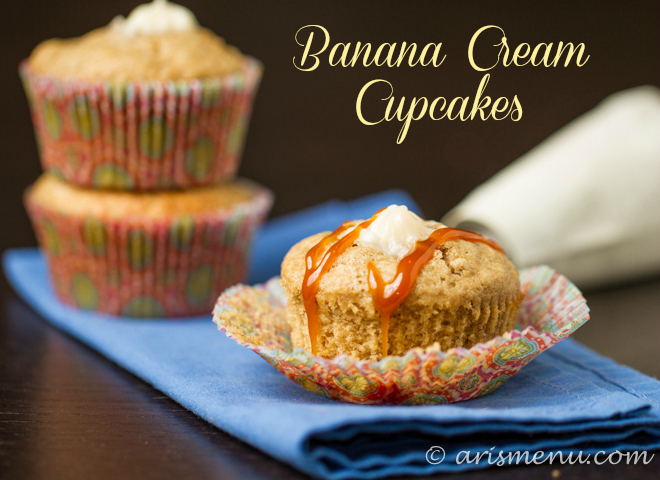 The banana makes the cupcakes ridiculously soft, and they are totally stuffed with the cream cheese filling, and that salted caramel is just the icing on the cake. Literally. To make the cupcakes, preheat the oven to 375. Line 2 muffin tins with 18 paper liners. Set aside. 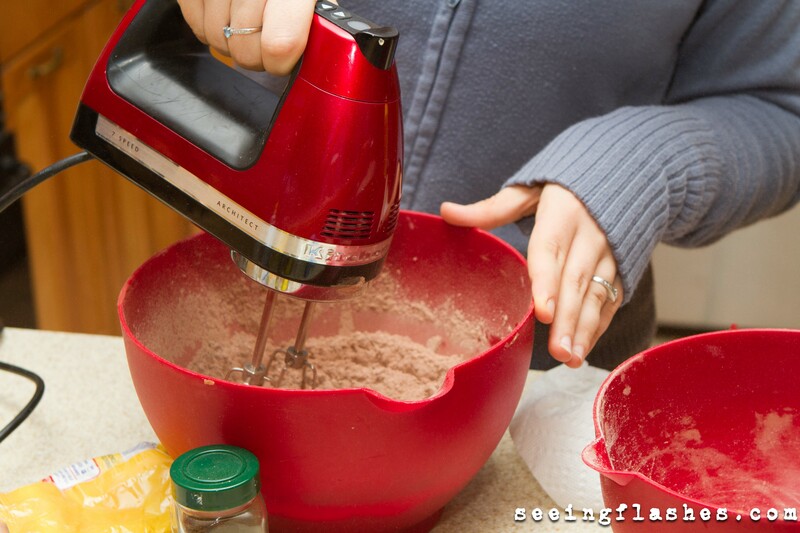 In a medium bowl, whisk together flour, baking soda, baking powder and salt. Set aside. In a large bowl, beat together apples, apple sauce and sugar. Slowly, beat in eggs one at a time, followed by vanilla. Slowly beat in half the dry ingredients, then buttermilk, followed by the last of the dry ingredients. Evenly divide batter between 18 muffin tins. Bake until golden and a toothpick inserted in the center comes out clean with just a few crumbs, about 20-25 minutes. Cool completely. To make the filling, beat cream cheese, powdered sugar and vanilla together until well combined. Transfer to a pastry bag fitted with a large tip. 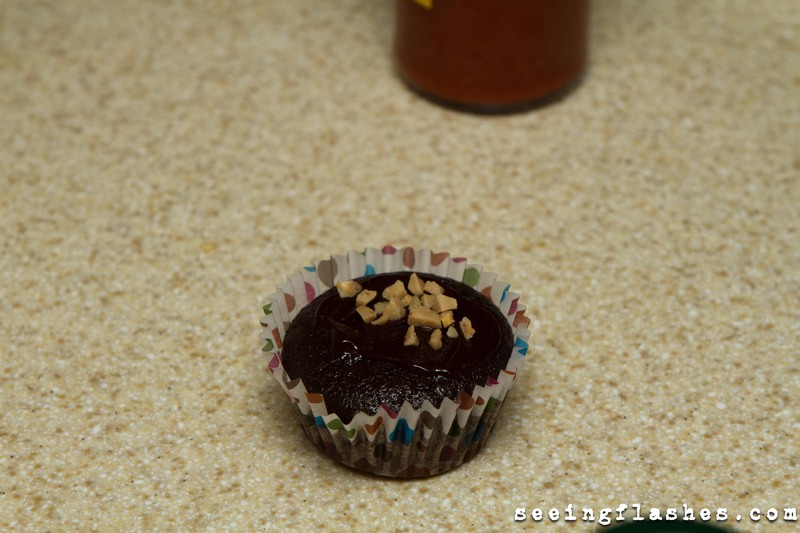 Insert tip into the center of cooled cupcakes and gently squeeze out 1-2 tbsp of filling. 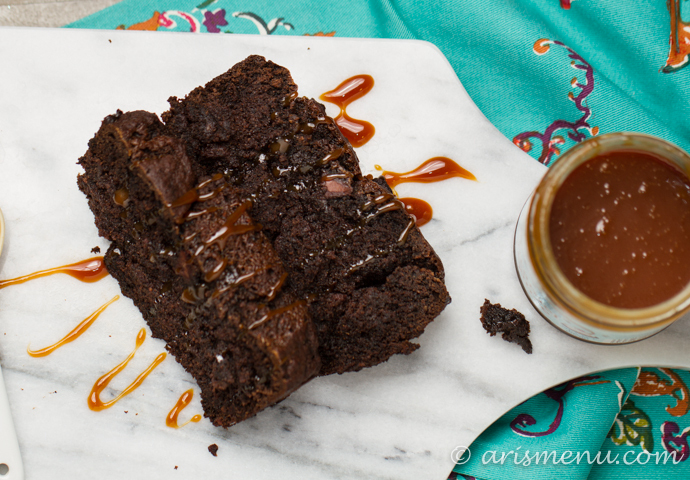 Drizzle with caramel if desired immediately before serving. 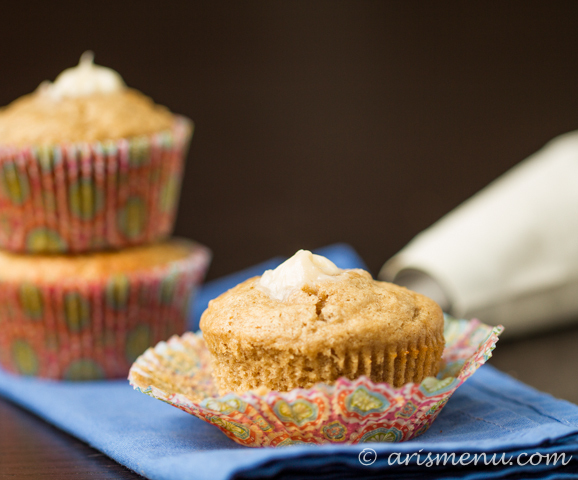 Cupcakes are best the same day, but can be stored refrigerated in an airtight container for up to 5 days. It’s here. The season I love to hate. Or hate to love. Yes, definitely hate to love: Girl Scout Cookie Season. For the past few years, I’ve avoided purchasing any all together, but this year a special girl in my life was selling them, and I just couldn’t let her not win the special prize for selling the most boxes, right???? But really, girl scout cookies happen only once a year, and the two boxes I purchased aren’t going to be the end of the world, as long as I don’t eat them all in one sitting. In fact, I’m proud to announce that a week in, and only one box has even been opened! This is what we call MASSIVE WILLPOWER over in my house. Plus, now that I have these donuts, that opened box of samoas isn’t drawing me in quite so heavily. The unopened thin mints in my freezer? Well, that’s an other story. Those long tubes of cookies are portion control’s worst nightmare. Oh, you say all of these delicious cookies come in 2 tubes? Well, clearly one tube is a “serving”, right? I’m actually trying to save them for when I decide just how I want them to be a part of a cupcake, or milkshake, or cookie inside of a cookie. 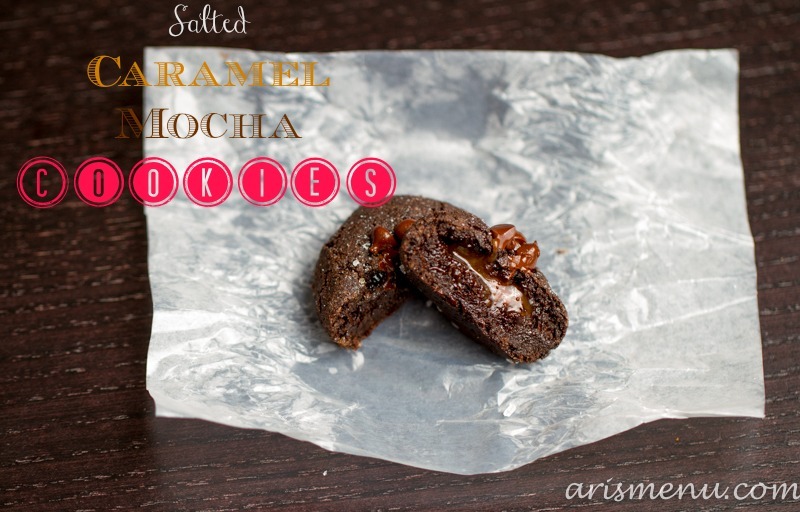 So how did I make these indulgent cookies into a completely vegan, and health(ier) dessert? Well, the donut part was easy. 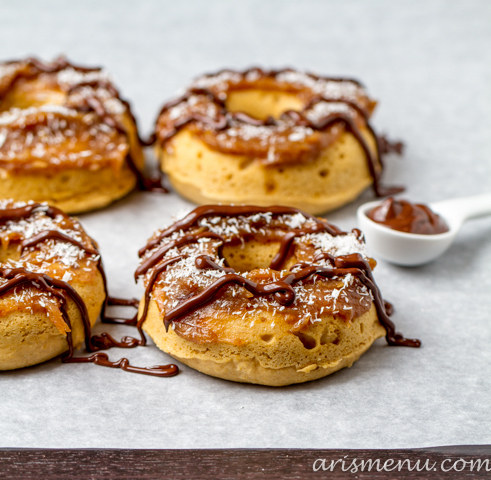 I have a pretty basic donut recipe that I love, and it didn’t require too much tweaking. Chocolate and coconut? Piece of cake. I don’t even buy that sweetened coconut. I love the finely shredded unsweetened low fat stuff. You can, of course, use whatever you want, but if I can get that delicious coconutty taste without the added sugar, I’ll take it! The caramel portion was tricky. I’ve seen date caramel all over the internet, and I’d been dying to try it. 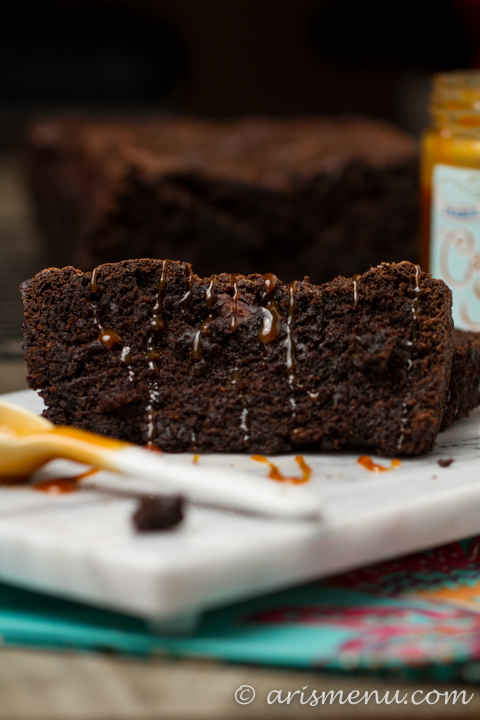 Dates are so sweet and gooey that it seemed like they could definitely do the trick! So I got out the food processor, played around, heated the mixture on the stove a little to get that extra-gooey effect, and voila! Now, I’m gonna be real with you here. 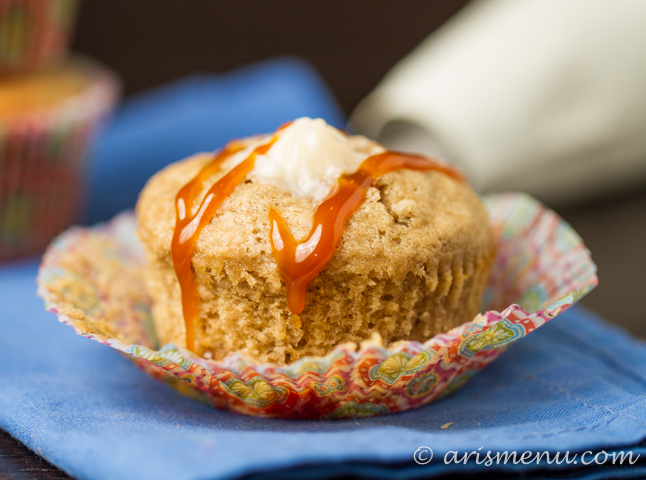 It doesn’t just just like that gooey buttery caramel we’re all used to and love. 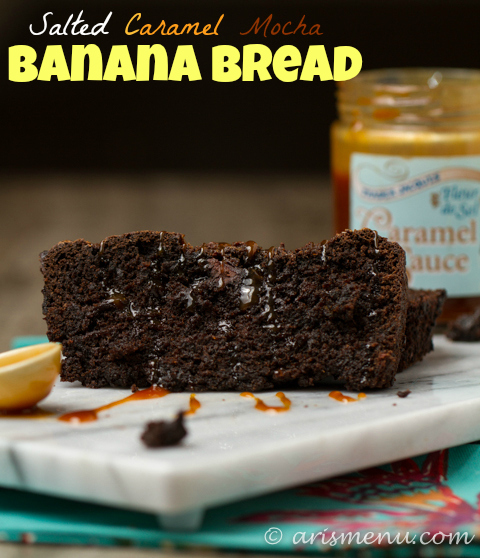 It is not an exact replica, but it does give you a sweet, caramel texture with no added sugar. I could have just eaten it with a spoon if I didn’t have donuts to make! And not just any donuts–ultra soft, pillowy donuts that taste like biting into a sweet, fluffy cloud. I don’t know why anyone fries these things when they bake up perfectly soft and sweet on their own. 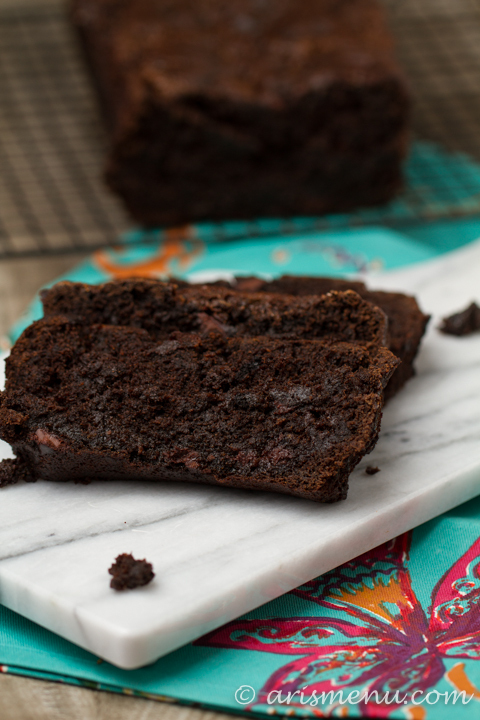 Add rich, bold dark chocolate, and you have everything you could ever need in a dessert. Place dates in a bowl and cover with hot water. Allow to soak while you prepare the donuts. In a medium bowl, whisk together flour, sugars, baking powder, corn starch and salt. Stir in 1/2 cup + 2 tbsp almond milk, vanilla and melted coconut oil. Gently stir until ingredients are just combined. Evenly divide batter between 6 donut molds. Smooth out tops. Bake for 10-12 minutes, until golden and a toothpick inserted in the center comes out clean. Cool completely in molds. Transfer dates + 2-3 tbsp of water from soaking to your food processor. Process until dates begin breaking down to more of a paste, about 2-3 minutes. Add a pinch of salt (you can also add a dash of vanilla extract if you’d like) and 2 tbsp almond milk. Continue to process until a caramel texture forms, about 2-3 minutes. Transfer mixture to a small saucepan, and cook on medium-low heat for about 5 minutes whisking constantly. Return back to the food processor, and blend again for about one minute. 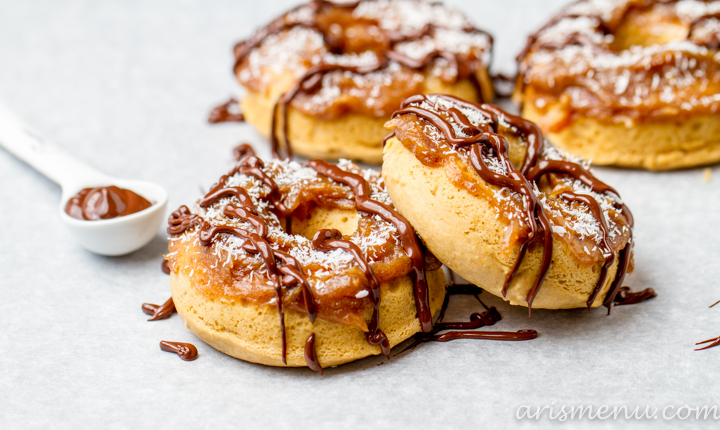 Top donuts with date caramel sauce, followed by a heavy pinch of coconut. Melt chocolate and room temperature coconut oil in the microwave for about 90 seconds, stirring every 20-30 seconds. Transfer melted chocolate to a large ziplock bag. 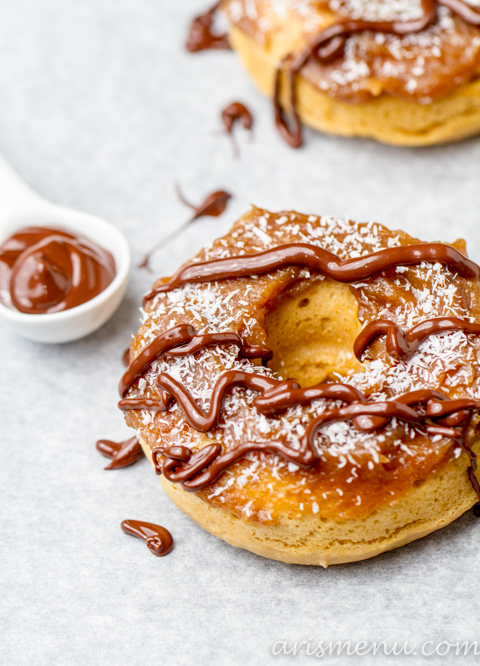 Snip off the corner of the bag, and drizzle chocolate over donuts. Allow to cool completely. Store in an airtight container for 5-7 days. I’ll never forget the year Starbucks released their Salted Caramel Signature Hot Chocolate. It was simultaneously the best and worst holiday season ever. It didn’t take long for this perfect flavor combination to become a near every day occurrence in my life. Did I mention I was living in northern Idaho at the time? It was cold, and nothing says comfort from the cold like a warm, rich, delicious drink. 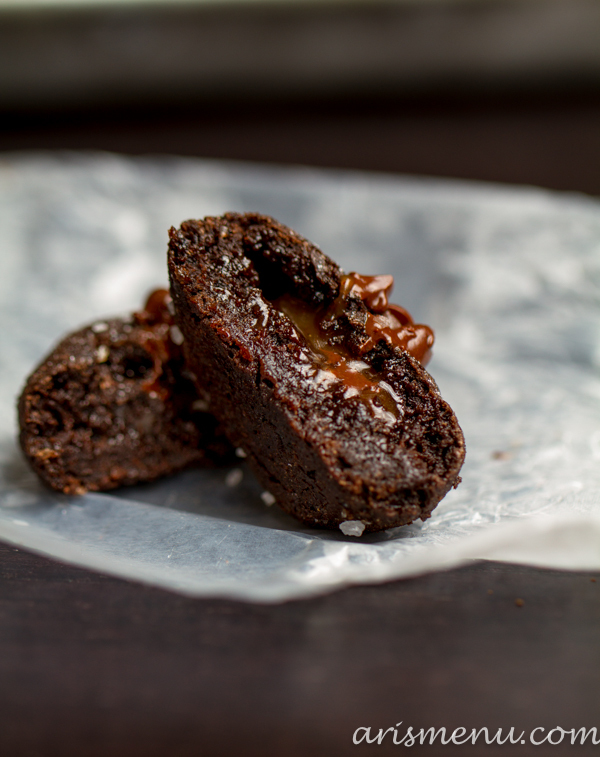 Except maybe a warm soft and chewy chocolate cookie filled with gooey caramel and topped with coarse sea salt. 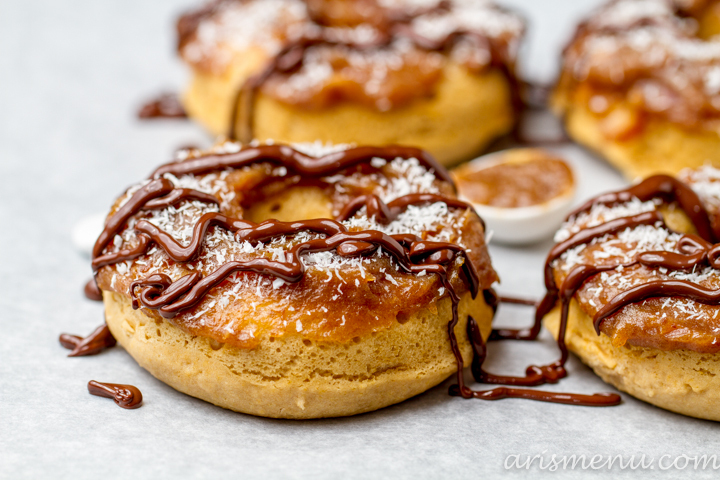 I knew as soon as my amazing friend Nicole shared some of her amazing caramels with me, that I wanted needed to make these cookies. Do you feel comforted yet? Once upon a time I used to be the comforting one. I was the one everyone went to when they had a bad day, and I would listen and give tons of advice that I probably had no business giving because I was kind of a hot mess myself, but I was, like, 20 years old and thought I knew everything. You know how it goes. I had (ummm, wait…I still have…) a special “heart to heart” pillow. That’s a little embarrassing. You hold it while you cry then I feed you words that magically fix everything, and at the same time put an end to world hunger. I know, I am so cool. These days however, I’m painfully aware that I know basically nothing, and so instead of pretending to be smart, I shove cookies in people’s face and call it “my way of showing I care”. Somehow, I think people prefer this. I may not be a master with words, but I have to say, I am pretty much a master of soft, gooey cookies. I mess up a lot of things in the kitchen (including ending up with things that are kind-of-not-really-at-all-baked on a regular basis…), but I always have soft cookies, and these cookies are like biting into a dark chocolate mocha brownie, finding surprise caramel on the inside, and then getting the hint of salt that cuts through the sugar to provide perfect balance. 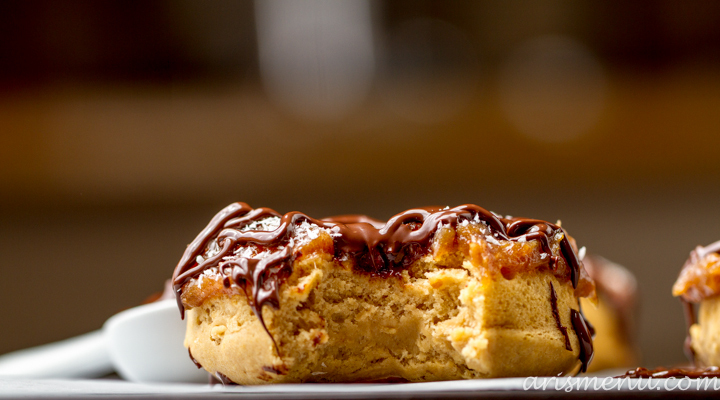 In a medium bowl, whisk together espresso powder, cocoa powder, baking powder and flour. Set aside. In a large bowl, beat together apple butter, sugar, vanilla and egg until well combined. Beat in dry ingredients. Cover dough and refrigerate for 1 hour. Preheat oven to 350. Form dough into 1″ balls. Press 1/2 caramel into the center of each ball and roll dough around until it is covering it completely, then place on lined baking sheet. 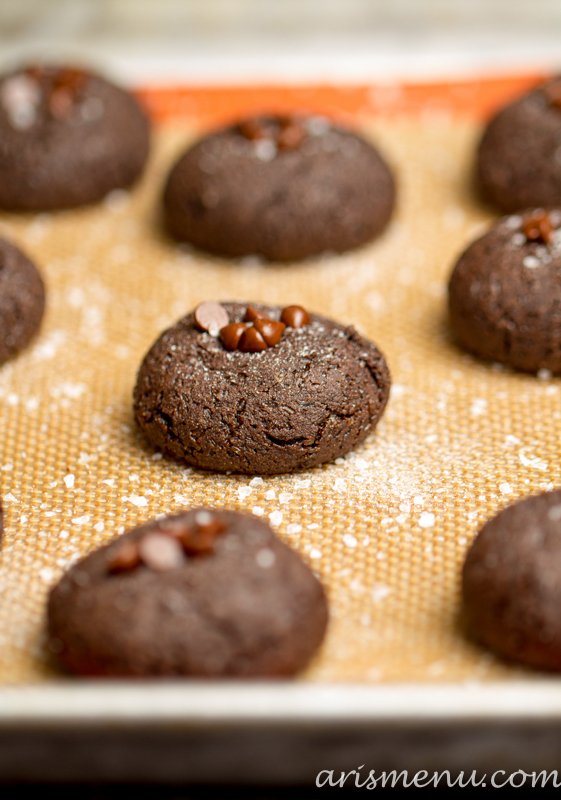 Gently press a pinch of mini dark chocolate chips onto the top of each dough ball, then top with a pinch of salt. Bake for 15 minutes until the edges have set and cookies pull easily off of the baking sheet. Let stand for 5 minutes, then transfer to a wire rack to cool. Preheat oven to 350. Line muffin tins with paper liners and spray with nonstick cooking spray. 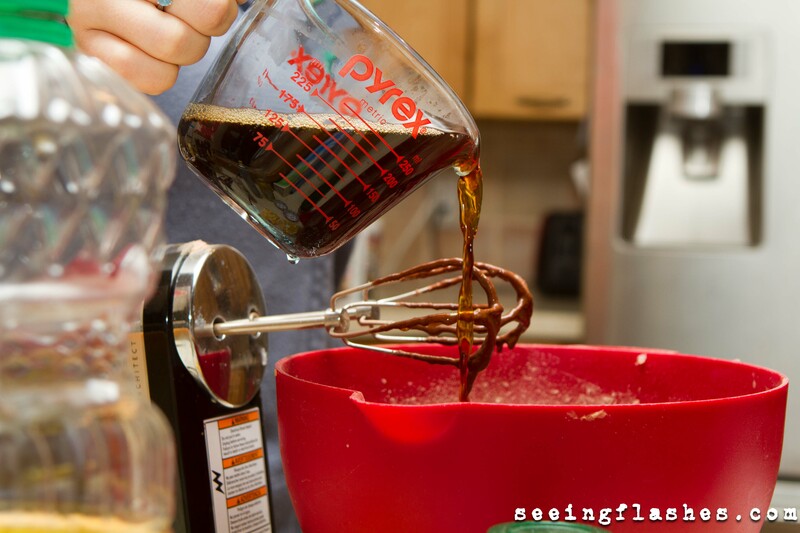 Whisk together flour, cocoa powder, via, baking soda and salt. Set aside. In a large bowl, beat together applesauce, sugar and Splenda. Add in vanilla and egg substitute. Slowly alternate beating in dry ingredients with coffee, starting and ending with dry ingredients. Fill liners 2/3-3/4 full and bake for 16-20 minutes until toothpick inserted in center comes out clean. Let stand for 5 minutes, then transfer to wire rack to cool completely. Melt chocolate, vanilla and butter for next layer in a microwave safe bowl stirring every 30 seconds until melted. Slowly add in milk until it reaches a smooth and creamy consistency. 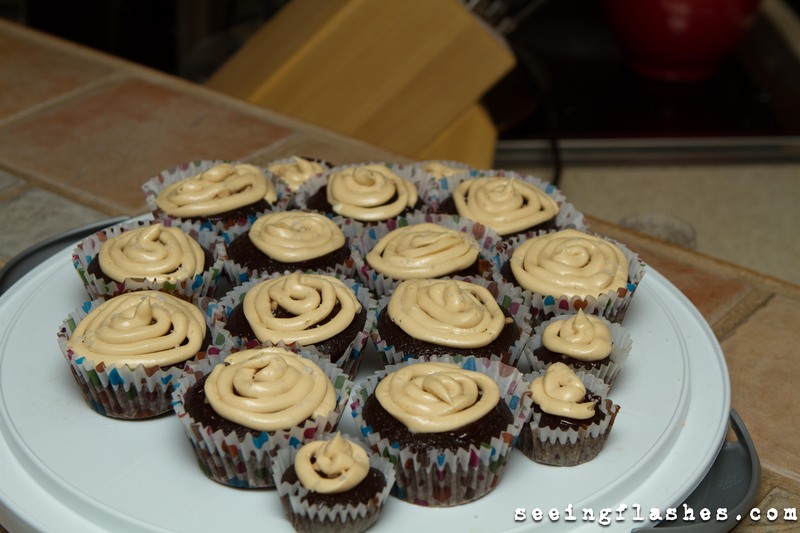 Using a butter knife, spread a small amount of chocolate on each cupcake. Sprinkle with a pinch of toffee bits. Begin frosting by using a hand mixer, beat together cream cheese, butter and vanilla. Slowly add in powdered sugar (use more or less depending on desired sweetness). Frost cupcakes. Sprinkle with Fleur de Sel or sea salt. I had big plans for these. I heard that Starbucks had peppermint brownie cake pops and I was so ready to show them up with salted caramel brownie cake pops! I under cooked my brownies just slightly because cake pops are supposed to be soft and fluffy. Well, apparently they were a little too soft. Make brownies per package instructions baking until just slightly undercooked. You want the toothpick to come out mostly clean and make sure the brownies are set and don’t dent down when you press lightly on the top. Cool completely. 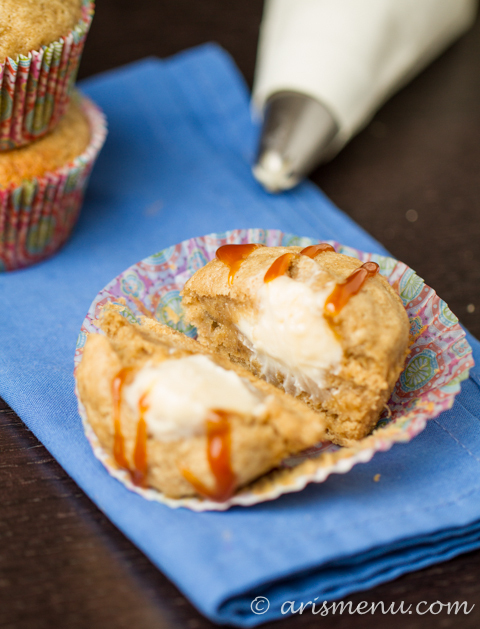 Meanwhile, combine cream cheese, butter, caramel and vanilla. Beat in powdered sugar. The fun part! Spray your hands with cooking spray. 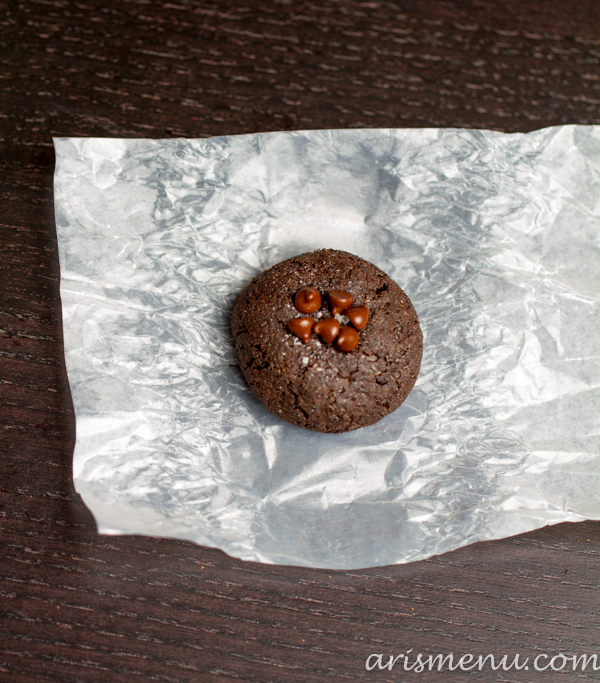 Using your hands, literally dig into the brownies removing enough to make small 1″ balls. 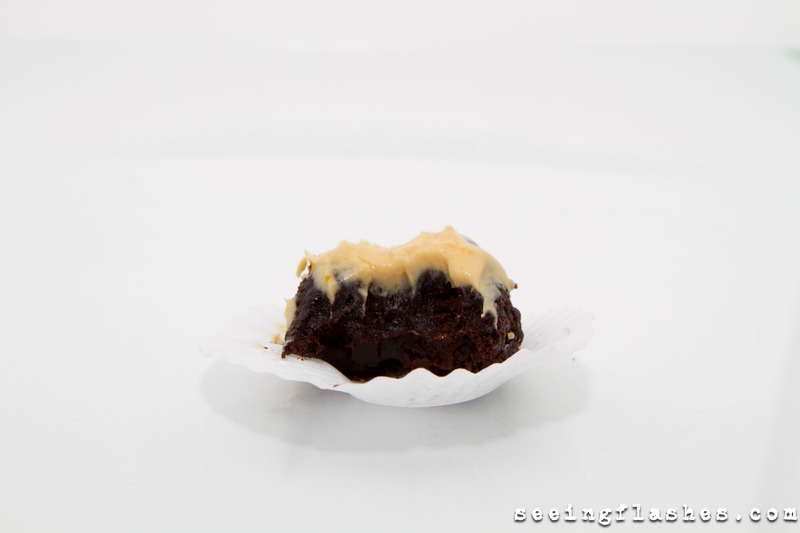 Dip rolled 1″ truffles into frosting coating the top (I learned this the hard way. Most of them I just rolled around in the frosting and they came out way less pretty than the one we dipped). Place unfrosted side down into mini muffin liners. Sprinkle tops with Fleur de Sel.